Hostile sentiment in much of the UK at the passing of the Iron Lady. You should see the graphics I DIDN’T post. So we’re mourning (obviously not ALL of us) the death of Margaret Thatcher. I’m not a blasphemous man. She was a human being with feelings, she nurtured children and grandchildren. But in the US, we seem all to ready to give a pass on the public actions of our leaders in order to ‘spare the feelings’ of those leaders’ families. And many pundits seem all to ready to surround Ms. Thatcher’s time in governance with the same rosy glow they gave to Ronald Reagan upon his passing. That’s at odds with the reaction overseas. 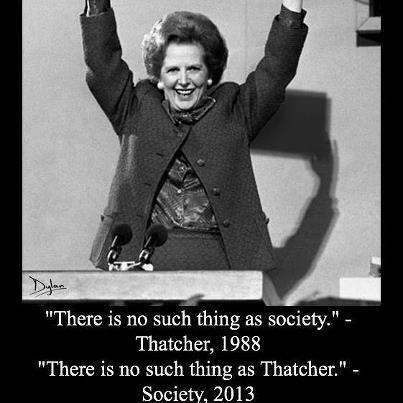 Both Pundits and many of Thatcher’s former subjects have been very quick to call her out one last time. In places like Brixton and Londonderry, they’re celebrating. This is important to think about her legacy right now because Thatcher helped bankrupt the UK. Not all at once, mind you, but over a period of several years. But don’t go by me–there are several long articles explaining all of this. The most fundamental act that Thatcher was famous for was the War in the Falklands. There are details for this here and here. It’s interesting to note that Thatcher was a beneficiary of an extraordinary piece of luck–during the hostilities, many of the bombs the Argentinian planes dropped on British ships had faulty timers on them and did not explode. And Leopoldo Galtieri, the hapless head of the Argentinian junta who thought the invasion would be a cake-walk, found that the years of poor training and lack of motivation of his army and navy left them unable to stop a British force that had come some 8,000 miles to defeat them. But Galtieri may have the last laugh. The Falklands war cost the British nearly $2 B dollars. For that money, they could’ve handed every British subject on the isles a million dollars and finished even. And the war saved the Royal Navy from the sharp budget ax Thatcher was about to use on it–the war and the presumed promise to defend the islands in the future, committed the British to thirty more years of upkeep for a foreign fleet capable of defending the islanders and their many sheep. And because of the Falklands, Britain felt indebted to the US for its help during that war. Driven from power, Maggie Thatcher beat the drum for the Gulf War and Britain’s involvement, and pushed Blair to support the War in Iraq. Wars are hard enough lifting for countries like the US; for the UK, they almost certainly hastened its demise as a player on the world stage. Ms. Thatcher’s other interventions into world politics (supporting the pro-apartheid forces in South Africa, sticking up for Pinochet in Chile, and her support for the Saudis) left an indelible impression about the way the British conduct foreign policy.